Research & Development is our major business since 30 years. GEPARD was the first company in Europe to have operational applications running on a parallel computing platform. This made applications feasible on your desktop that previously required expensive super-computers. The first applications included power plant emission simulation for urban management and forest damage classification from remote sensing data. Great echo on GEPARD´s 'Dream Fabric' at the Hannover Industrial Fair. 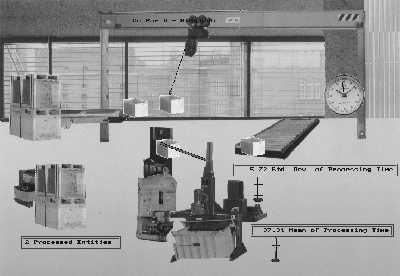 Simulation of production processes with real-time interaction features and high-speed, real-world image animation (25 images per second) on a parallel computer. Microtronic Application Price at the Hannover Industrial Fair for a real-time, free programmable test bed for car electronics. With this simulator, VW (Volkswagen) could connect and fully test their automatic gear control devices within a simulated real-time 'driving car' environment. This fast desktop hardware-in-the-loop simulator saved 30,000 km of dangerous test drives per year. Delivery of the world's fastest display system for large satellite images to the European Space Operation Centre. The system features animation loops of hundreds of 5000 by 5000 images at more than 25 images per second, offering interactive zoom, pan, and color manipulation even during running animation. Final validation of the CineSat real-time water vapor wind computer by ESA. For the first time ever, meteorologists had half-hourly cloud motion winds available for the full Earth disk. By developing new algorithms and parallel processing hardware, the computing time has been reduced from 4 hours to 10 minutes. The system also features a fully automatic quality control of the computed wind field. GEPARD is the only company to successfully propose and implement a solution for the on-ground correction of the Meteosat-6 radiometer anomaly. Two of the three satellite image channels suffered from an anomaly of unknown source that distorts brightness values in an unpredictable way. The temperatures measured by this satellite differed up to 15 degree Celsius from ground measurements and the reference satellite. GEPARD's 'Software Glasses' correct a highly variable and unpredictable radiometer anomaly in real-time at ESOC and EUMETSAT ground segments. The quality of the corrected images is comparable to those of the reference satellite. This solution has become known as 'The Software Glasses'. It saved the Meteosat-6 mission and the costs for an entire new satellite. Development of CineSat Nowcast - the world´s first short-range weather forecast system that accurately predicts future satellite cloud images in real-time. Development of a new 'fuzzy' methodology for automatic fusion of meteorological weather prediction models with satellite imagery. In close coperation with ZAMG, GEPARD developed an operational real-time system for Automated Satellite Image Interpretation. 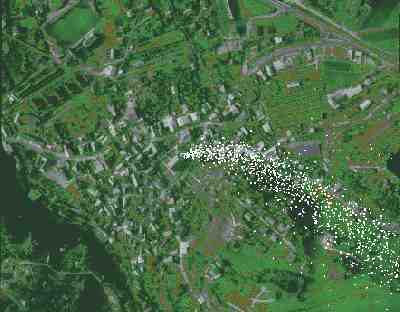 The system automatically detects more than 20 weather phenomena by analysing half-hourly satellite imagery and numerical model data. The software is now incorporated in EUMETSAT's Nowcasting SAF project. 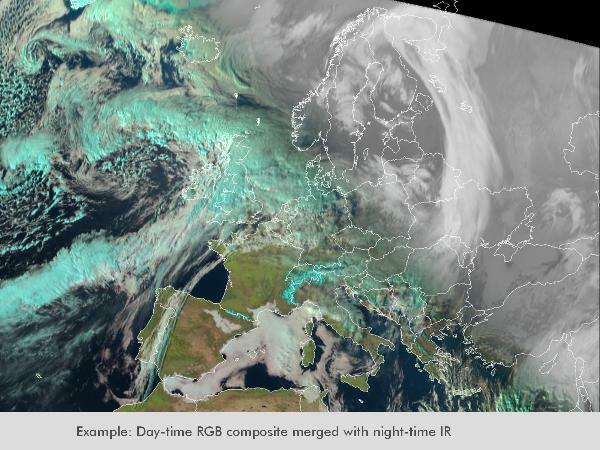 Development of a fully featured weather image processing, analysis and forecasting system for meteorological satellites. It includes standard and sophisticated image pre-processing techniques (like calibration, sun angle correction, filtering), supports more than 60 types of geographical projections, performs a fully automatic real-time production of user configurable weather products. Several unique features included, like automatic convective cell analysis, cloud development analysis, cloud motion analysis, as well as the prediction of future cloud motion, and satellite image movies that run into the future. CineSat is in operational use at major meteorological sites, at national institutes, airports and military, for early warnings, in support to important economic decisions, for research and development applications. Meteosat Second Generation start-up phase for the award-winning CineSat MSG Edition V3.0. Suitable for major national weather services, airports, and military sites, in support to operational weather forecasting and to developing new weather products from the new satellite data. An innovative Drawing Tool saves valuable time in the production of weather plots and their necessary variants for different end-users. Usually, it's been a long way for R&D teams at customer sites, to go from a research prototype to operational production. CineSat V4 seamlessly bridges this gap, and makes the transition of prototype weather products to operational 24/7/365 real-time production just a matter of a few configuration settings, without changing a single bit of code. CineSat V4 is completely re-designed, and again faster in performance, with many new and enriched functions. The major innovation is an enterprise-ready and update-resistant configuration scheme that supports multi-level, hierarchical, and conditional configuration with any number of cascaded profile layers. Users can now easily create and test several variants of an existing configuration, collaborate in workgroups, and define enterprise and group defaults. This makes development, testing, and operational production of new weather products quite easy. The comment of first customers using this sophisticated scheme: “It's magic”. The synchronization of highly concurrent applications under heavy load requires fast, real-time process information - sometimes faster than standard Unix tools can provide it. Therefore, we designed and developed a fully decentralized and distributed process management system for the CineSat application. This new secure task management is independent from the Linux flavor and operating system versions, benefits from multi-processor architectures, and can easily manage the negotiation and priorities between hundreds of processes fired up at the same time. This makes CineSat very robust against failures of processes e.g. due to full disks, manual kill of processes, server shutdown, and power outage. GEPARD has a long-term reputation for finding creative solutions to challenging tasks. Just call us to discuss your wishes, projects, and requirements.